With December upon us, the invitations to holiday gatherings have rolled in, and they’re filling up my calendar! As I write this post, I just got back from a staff formal dinner… and thus starts the craziness of December! Countless Christmas shows to attend, a couple of shows to put together, so much decorating to complete around the house, a few gifts still left to buy, and a few more to wrap. Not to mention actually remembering what Christmas is all about – Jesus. Oh, that’s right! Jesus! It’s all too easy to forget the reason for the season as we eat until our bellies are full, shop ’till we drop, and party hardy. One of the best ways we can honor Jesus, our Messiah, is by showing His love to others. I’ve been thinking about ways to honor the people in my life and love them better. So instead of a gift guide full of more stuff to buy and order (lots of other blogs have those! 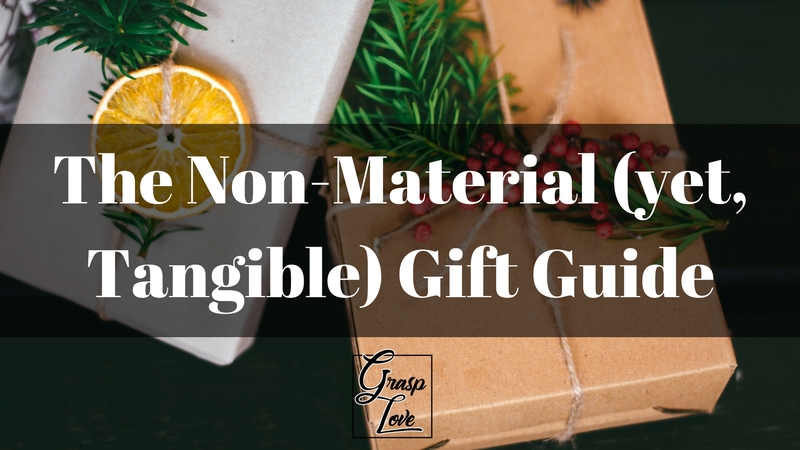 ), I’ve put together a Non-Material (yet Tangible) Gift Guide. This list isn’t just for Christmas, but I have more days off during the holiday season so you better believe I’m making some dates, and giving these gifts! Don’t worry, you can still get your loved ones physical gifts, but I will say the ones on this list will save you plenty of wrapping paper! HA! Thank someone that has taught you a valuable lesson this year. Include a thank-you card that you will give them upon speaking with them. Thank someone that has blessed you somehow this year. Include a thank-you card that you will give them upon speaking with them. Spend 2-3 hours with someone you have not bonded with in a while. Invite them out if you have to. Give up 5 minutes of your time to intently listen to someone. Don’t wait to respond while they’re speaking; just listen. Pray for God’s blessings, guidance, and revelation over someone you love every day until Christmas. Pray for God’s blessings, guidance, and revelation over someone you hate every day until Christmas. If you live with other people, do some chores that don’t pertain to you. Extra dishes to wash? Done. Another toilet to clean? You got this! Give up a comfort in your life (daily latte, eating out, shopping for yourself, etc.) and give that money to the person that God places in your heart to give it to. Share the Gospel with someone that needs it. My favorites are 5, 6, & 8! I am praying that this Christmas season you will not be overwhelmed with busyness. Rather, that you will be overwhelmed with God’s hope through Jesus. I pray that your hope in Him will fuel you to give these Non-Material gifts to the people in your life. I pray that all the people you will bless may come to know the Lord Jesus Christ this season, and that God may be glorified in and through your life! 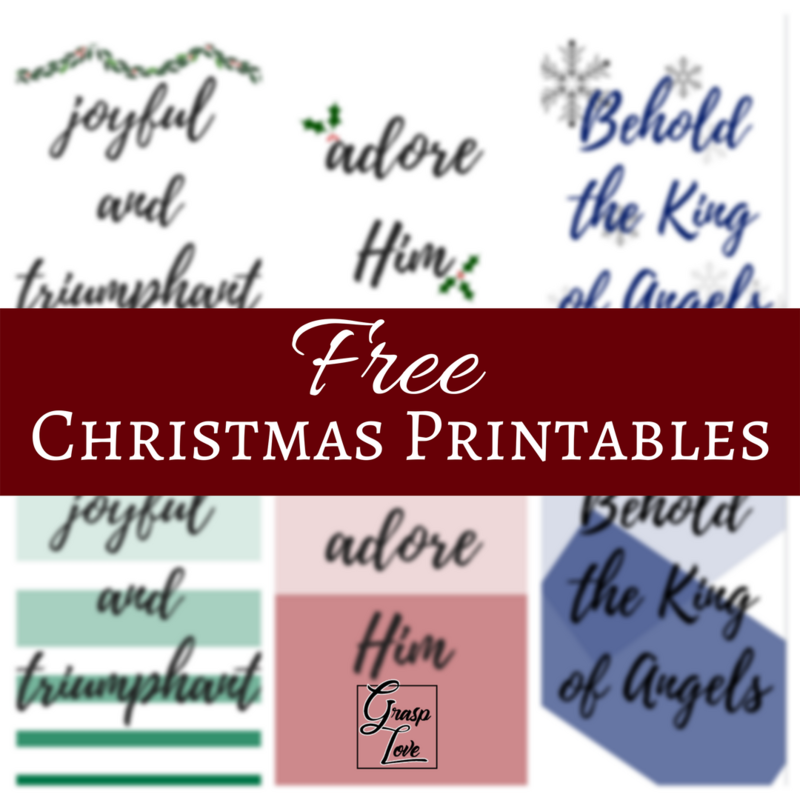 For the month of December only, we are giving away FREE Christmas printables! Just subscribe to our newsletter by clicking above and they’ll be sent directly to your inbox! Our printables include the lyrics of “O Come, All Ye Faithful” designed in 2 Christmas styles – classic and modern. Our gift to you for subscribing! This is an awesome list and a great idea. ThNk you so much!